Great News. ViralFB is now alive again. Their website www.fffscript.com is active again. I was able to log in with my account and was able to download updated file from their website. It is name is update 4.1. I am not sure it is refer to version 4.1 or not. Anyway I would like to share this file to the one who needs it seriously. Please use this file as your own risk. I will not take any responsibility if something happens to your website. I admitted that I haven’t tried it yet. Just downloaded and want to share with you all. 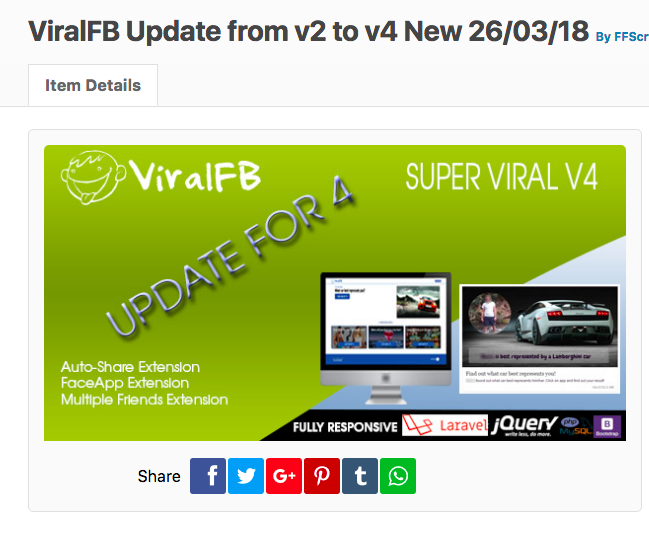 Any solution to overcome Facebook Ads not approved issue? Thanks Alot Bro, plan to merge both socioquiz and viralfb together. Hopefully it works well. bro can you share ViralFB script too ? I only have old version bro. Even it is installable, you need activation code from ffscript to activate it bro. I download script file and install on my server but after I log in admin panel it not work. it always show me incorrect user name and password. have you purchased from ffscript?